Everyone’s infrastructure is growing – today mostly in the container space. 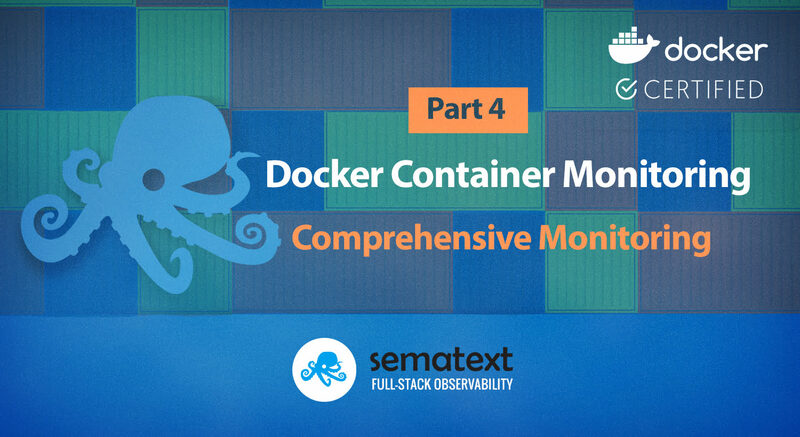 As we learned in Part 1 of this series – Docker Container Monitoring and Management Challenges, monitoring for containers is different from traditional server monitoring. In Part 2 we had a glance at key container metrics and in Part 3 we compared several open source tools for container monitoring. Open-source monitoring tools are free, but your time is not. Relatively speaking, it’s actually rather expensive. Thus, Sematext aims to save you time, effort… and the hair you might lose in the process. The above is not even a complete story. Do you want to collect container logs? Want to structure them? Prepare to do more legwork. In this post, we will look at how Sematext provides more comprehensive – and easy to set up – monitoring for containers in your infrastructure by combining events, logs, and metrics together in one integrated full stack observability platform. By using Sematext Agent, you can monitor your whole infrastructure and apps, not just your containers. You can also get deeper visibility into your full stack by collecting, processing and shipping your Logs with Logagent and analyzing metrics, events and logs together in Sematext Cloud. Let’s explore each of them. Most non-containerized applications write logs into files, while containers write their logs to the standard output and standard error stream (console). Thus, container logs are console output streams from containers. This data might be a mix of plain text messages from start scripts and structured logs from applications. The problem is obvious – you can’t just take a stream of log events all mixed up and treat them like a blob. You need to be able to tell which log event belongs to what container, what app, parse it correctly, etc. Docker log drivers help to ship logs to log management servers, however, most logging drivers don’t help with parsing container logs. Therefore most logging solutions use separate tools like Logstash or rsyslog to structure logs before forwarding them to log storage. When we use multiple different components with dependencies for log processing, the chance that the logging pipeline will break increases with each new component. There are a few Docker Log Driver Alternatives. One of those alternatives is Logagent – an all-in-one solution for container log processing. Logagent is a general purpose log shipper. The Logagent Docker image is pre-configured for log collection on container platforms. It runs as a tiny container on every host and collects logs for all cluster nodes and their containers. All container logs are enriched with Kubernetes, Docker Enterprise, and Docker Swarm metadata. A rich set of configurations options for logs is available and Logagent provides the option to use all input plugins, filter plugins, and output-plugins. The format for log parser patterns remains the same. Logagent recognizes log formats from various applications / official container images out of the box. Custom log parser patterns can be specified to process any kind of log formats. Pattern library included covering a set of common databases, web servers, message queues, etc. Logagent collects not only local container logs. Logagent can also collect logs from all cluster nodes by mounting log file directories into the Logagent container. To run Logagent you will need a Logs App token. If you don’t have any Logs Apps yet, you can create one now. The Sematext UI displays copy and paste instructions for running Logagent, which you can see below. See more in Logagent on Docker docs, which also show how to run Logagent in Kubernetes and OpenShift, Docker Swarm and Docker Enterprise, Apache Mesos, and more. LOGS_RECEIVER_URL: The URL of your Elasticsearch endpoint (defaults to Sematext Cloud US https://logsene-receiver.sematext.com). For Sematext Europe use https://logsene-receiver.eu.sematext.com. LOGS_TOKEN: The logs token of your Sematext logs App. Binding to Docker engine socket (-v /var/run/docker.sock:…) to retrieve logs via the Docker API. Once you run the command above, all container logs will show up in Sematext UI. You will see logs from containers and the host in the Sematext Logs App. Host and container logs get tagged with a “logSource” field holding the log filename for hosts and image name and container name for containers. If you run health checks for your containers, you might see every health check in the log output. The information is not very valuable and consumes log storage and network resources. Setting IGNORE_LOGS_PATTERN=/healthcheck|/ping will remove the noisy health check URLs in your server logs. We will stop here, move on to more examples for Docker Enterprise, Swarm and Kubernetes. Feel free to explore the documentation addressing more topics like blacklisting/whitelisting of container logs or log routing. -e LOGS_TOKEN="YOUR LOGS TOKEN HERE"
We can check the service status with docker service ps st-logagent. We should see that Swarm deployed Logagent to all nodes. Because Logagent adds rich metadata, including host and IP address fields, to all logs it is easy to track logs by a host, swarm service, or container. Docker Enterprise doesn’t support only Swarm mode. We can also use Kubernetes deployments with Docker Enterprise. Let’s explore the Kubernetes deployment of Logagent next. Once you have container logs in Sematext you can search them when troubleshooting, save queries you run frequently or create your individual logs dashboard to have better insights into information in your logs. When digging through logs you might find yourself running the same searches again and again. To solve this annoyance you can save queries so you can re-execute them quickly without having to retype them. Please watch how using logs for troubleshooting simplifies your work. A typical troubleshooting workflow starts from detecting a slowness through metrics, then digging into logs to find the root cause of the problem. Sematext makes this really simple and fast. Your metrics and logs live under one roof. Logs are centralized, the search is fast, and powerful log search syntax is simple to use. Correlation of metrics and logs is literally a click away. Sematext Agent collects metrics about hosts (CPU, memory, disk, network, processes), containers and orchestrator platforms and ships that to Sematext Cloud. To gain deep insight into the Linux kernel, Sematext Agent relies on eBPF to implant instrumentation points (attach eBPF programs to kprobes) on kernel functions. Using Linux kernel instrumentation allows Sematext Agent a very efficient and powerful system exploration approach. Network tracing uses Linux kernel-level eBPF to collect information about network connections being made and established. Unlike traditional pcap-based network monitoring, the eBPF approach incurs negligible overhead. Sematext Agent can auto-discover services deployed on physical/virtual hosts and containers. It also collects data about your infrastructure to provide you with infrastructure inventory reports. It collects events from different sources such as OOM notifications, container or Kubernetes events. Docker Swarm metadata such as Service name, Swarm Task etc. Docker events such as start/stop/die/volume mount, etc. Kubernetes events such as Pod status changes deployed, destroyed etc. That is a lot of information and Sematext organizes this information in reports for infrastructure monitoring, container monitoring, and Kubernetes cluster monitoring. The Sematext agent is fully Docker Engine and Kubernetes-aware. It collects Kubernetes metrics in the most optimal fashion possible. When deployed to worker nodes, Sematext agent relies on Kubernetes leader election mechanism to elect one instance of the agent to act as the leader, thus minimizing the agent impact. Such cluster agent leader collects cluster level metrics (deployment, pod, stateful set stats) and Kubernetes events, while other agent instances are in charge of gathering kubelet-specific metrics, as well as container metrics for workloads collocated on the node where the agent is running. Kubernetes clusters running lots of nodes will see the most benefit from this newly optimized Sematext agent. Sematext agent gathers information about processes inside and outside containers, thus providing data for the new Sematext process monitoring functionality. Let’s see how Sematext Agent is deployed. To run Sematext Agent you will need a Docker App token. If you don’t have any Docker App yet, you can create one now. The Sematext UI displays copy and paste instructions for various ways of deployments for Docker, Docker Enterprise/Swarm, Kubernetes Daemonsets or Helm charts. The Sematext Agent Documentation contains all configuration options. After a short time, you will see container information in the infrastructure monitoring, Docker- and Kubernetes reports. A basic Docker setup for Sematext Agent shows the mandatory options. First, the agent mounts system directories to collect all relevant information. The tokens are used to ship the metrics to the right Sematext App. The JOURNAL_DIR is used to buffer metrics locally in case of any error during metric transmission. Then we set logging options to configure the log output. For troubleshooting, the logging options can be modified to get a verbose output of the agent activity. The parameter CONTAINER_SKIP_BY_IMAGE is used to exclude containers from being monitored. Behind the scenes, Sematext Cloud automatically tags all containers with their Docker hostnames. Therefore it is easy to see where a container is running. You can use these tags for filtering and slice and dice your containers’ metrics as you see fit. Grouping by tags lets you quickly drill down to specific containers to see what’s happening within each one, should you need that level of detail. Beyond that, the automatic generation of dynamic container performance heat maps will instantly lead you to the “hottest” containers in your entire infrastructure. The containers view discovers all your containers over all nodes in all your Kubernetes, OpenShift, Docker Swarm clusters or any other container platform supported by Sematext Docker Agent, such as Amazon ECS, Mesos, Rancher, or Portainer. The main view is very much like “top for containers” – applied across all of your containers and their hosts. You can sort containers by memory or CPU usage to find the hottest containers, or simply display the Top N containers. The detail view of each container displays container metrics in real-time. For more massive infrastructures, you can quickly drill down by using the filter and grouping functionality. Grouping by hosts or images turns the list view into a hierarchical view. The UI shows a heatmap with the hottest containers according to the grouping criteria. In Sematext Cloud you will also find historical metrics, logs, container events, and a lot more. All these observability data are seamlessly integrated so you can access it with just a few mouse clicks, starting from the new container view, container reports, and combined metrics & log dashboards. Let’s see how to actually create some alert rules for container metrics in the animation below. The pod restart chart below shows a growing number of restarts. We normally have no pod restarts, but we see it can jump to over 400 restarts caused by a failing Kubernetes cronjob. To create an alert rule on a metric go to the pulldown in the top right corner of a chart and choose “Create alert”. The alert rule applies the filters from the current view and you can choose various notification options such as email or configured notification hooks (PagerDuty, Slack, VictorOps, BigPanda, OpsGenie, Pusher, generic webhooks etc.). Alerts are triggered either by anomaly detection, watching metric changes in a given time window or through the use of classic threshold-based alerts. Container Events are very valuable for monitoring. Events reflect change in your infrastructure – from node restarts to container deployments or changes on running containers. You can track every docker command, which is very valuable not only for configuration changes. Events are also a good source for security audits. Sematext agent collects events from the docker engine and Kubernetes API. Whenever something goes wrong in your container stack – you can correlate logs or metrics with the time of container events! Your HTTP API server was not reachable and a load balancer had HTTP 500 server errors. When you check then container events, you might see that the API server container was restarted at the same time – root cause found with a few mouse clicks! One of your applications in a container behaves differently from others. You might find a Docker “exec”, “commit” and “restart” events indicating that somebody modified one container at runtime! If you are not hacked, one of the developers might have done a “hotfix” and forgot to fix the problem in the application image. We could continue here with an endless list of examples … once you get used to monitoring container events for security audits or troubleshooting you will never want to miss it again! Commit – when changes to the container filesystem are committed. Modifying deployed containers in production is not a common practice, therefore the commit could indicate a “hack” and should be watched carefully. Copy – when files are copied from/to a container. Could indicate a potential data leak. Sematext shows all events in a chart and helps you search for container events. While the event view exists as a standalone view, you can also add it to any other dashboard in Sematext with a simple switch to correlate events, logs, and metrics. Comprehensive monitoring for containers involves identifying key metrics for the cluster nodes, orchestration layer, and containers, collecting metrics, logs and events, and connecting everything in a meaningful way. In this post, we’ve shown you how to monitor containers metrics and logs in one place. We used out of the box and customized dashboards, metrics correlation, log correlation, anomaly detection, and alerts. Using open-source monitoring integrations, you can easily start monitoring containers alongside metrics, logs, and distributed request traces from all of the other technologies in your infrastructure. Get deeper visibility into containers today with a free Sematext trial.